If you have, these can be signs of foundation failure. Call the professionals at Atlas Piers of Atlanta. Foundation failure and settlement is caused by the changing soil moisture content beneath and around your foundation. When the soil gets saturated with water, it will swell and when the soil is dry, it shrinks. This continuous movement will cause the foundation to also move, creating the signs of foundation failure in the interior of your home. Let the professionals at Atlas Piers of Atlanta inspect the interior damage and determine if it is caused by foundation failure. The experts at Atlas Piers of Atlanta have several solutions to repair whatever interior damage you may have. We will inspect your home and find the best solution for your interior damage repair. Some of the solutions we use are helical piers, steel push piers, helical tiebacks, and carbon fiber. Steel push piers are resistance piers that support and stabilize the structure’s load bearing walls by transferring the weight of the structure from weaker soils onto the steel piers that have been driven to load bearing soils. There are an excellent choice for structural foundation repairs. Helical tiebacks are used to repair bowing or leaning walls. 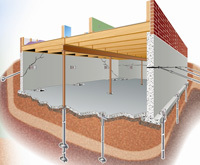 They are designed to stabilize and strengthen the basement walls. They are installed from inside the basement wall through a small hole has been drilled. This hole is sealed and repaired after installation. Then with exterior excavation, the basement wall is immediately pulled back to its original level. Carbon fiber is used to repair interior damage to basement walls.This method uses carbon fiber strips that are applied to the wall after it is smoothed and covered with a high strength epoxy. Then the strips are ingrained into the epoxy using pressure and a steel angle is bolted to the top. This will stabilize the wall so no further movement occurs. This process is simple and the installation is quick. Carbon fiber is an incredibly strong material that cannot break or stretch. So when this method is used to fix basement walls, the repair will be permanent. All of the products we use for foundation repair and interior damage repair are manufactured by Earth Contact Products (ECP), the leader in foundation repair products in the industry. At the first sign of interior damage, contact the professionals at Atlas Piers of Atlanta. With our experience and using the best products available, you can be assured that the repair is done with a permanent solution.